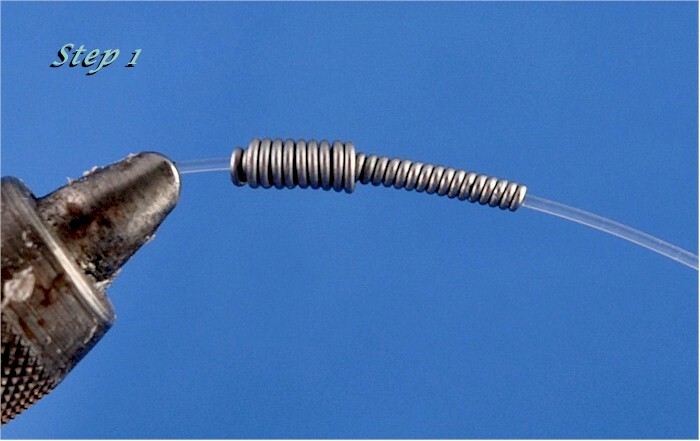 Hook: Targus 2/0 TAR9413 jig hook or equivalent. 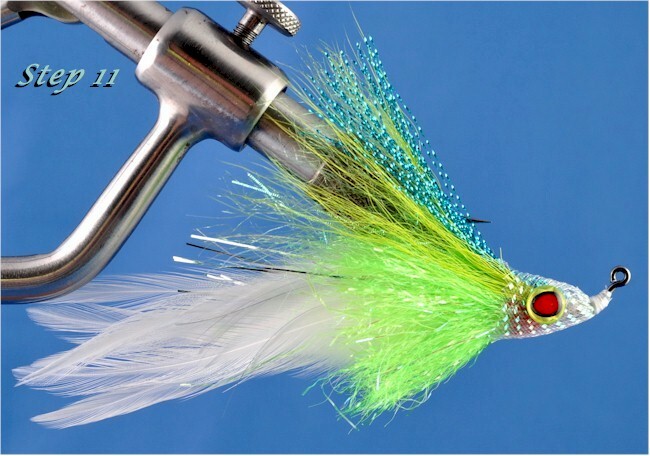 Eyes: Just Add H2O 8mm Frantic Eye, chartreuse or favorite 3-D eyes. 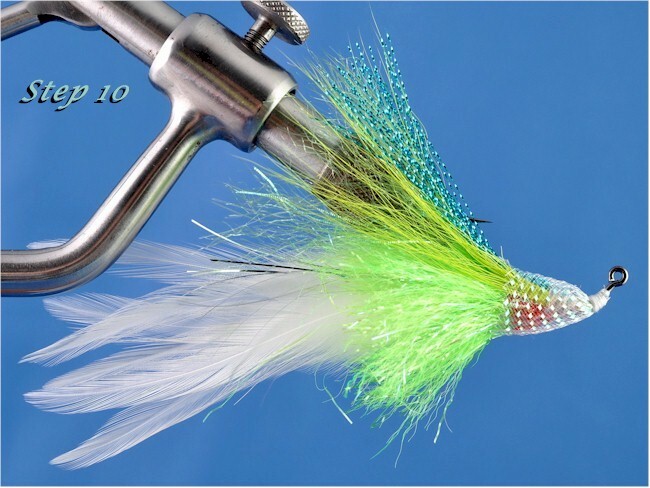 Thread: White Danville’s 210 waxed Flymaster Plus. 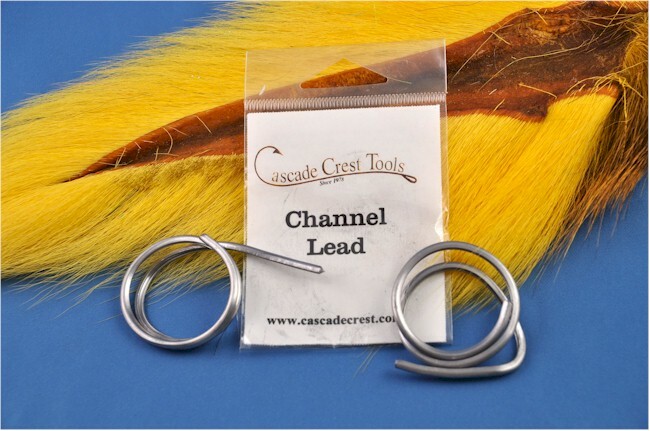 Keel weight: Wrapped-lead wire over mono or Cascade Crest Tools’ Channel Lead, medium. 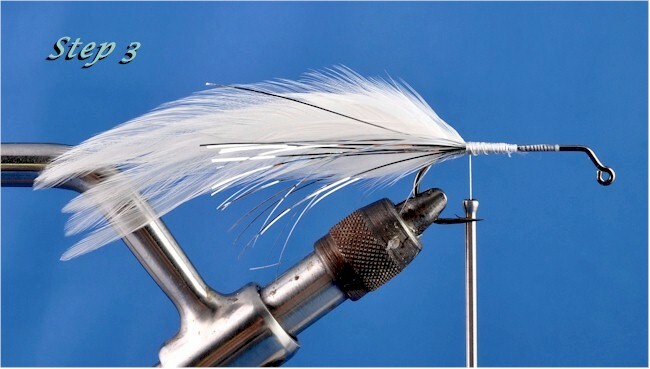 Tail: Six white saddle hackles, 3-each side. 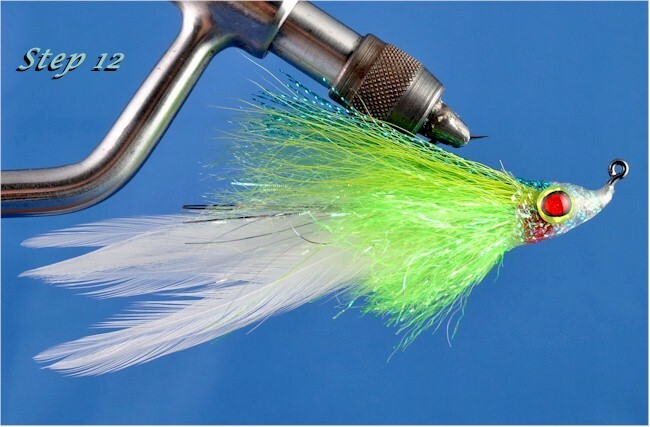 Body: Baitfish Emulator Flash syn hackle, chartreuse. Collar: large, red Cactus chenille. 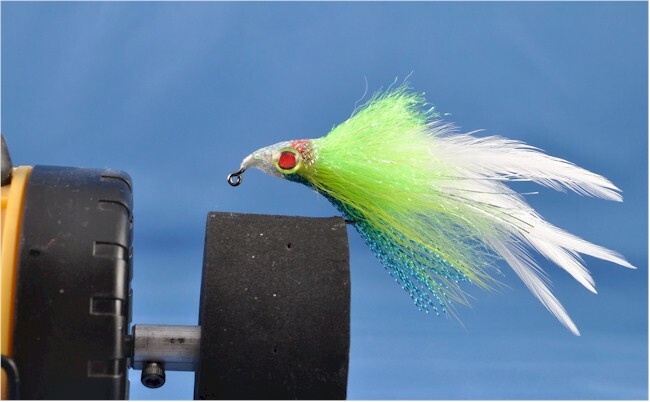 Wing: Chartreuse Flash `N Slinky syn hair; chartreuse bucktail. Topping: Light Blue Crystal Flash. 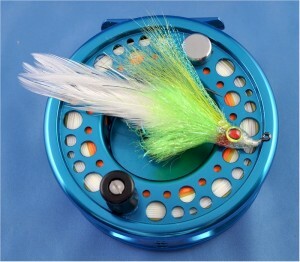 Head: Large Diamond Braid coated with epoxy or UV cure coating. 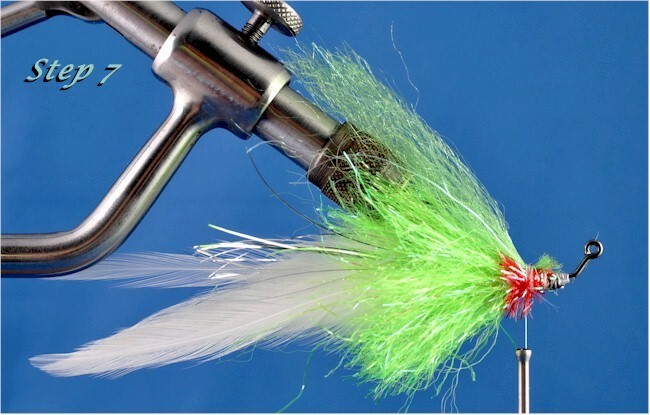 Step 2: If using the wrapped-lead keel-weight, tie in six white, saddle hackles, curved sides together at bend of hook Deceiver style. 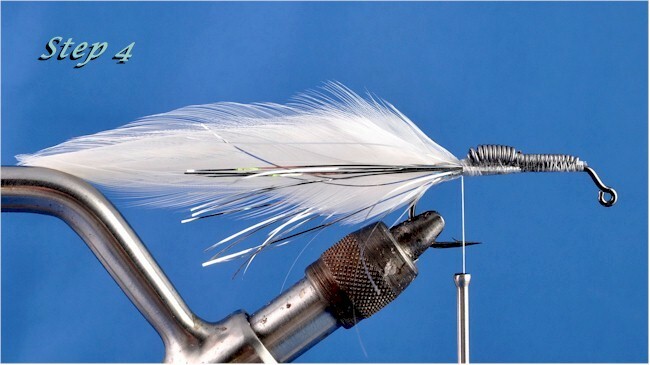 Step 3: Tie a few strands of silver Flashabou along each side of the tail hackles, about half the length of the tail. 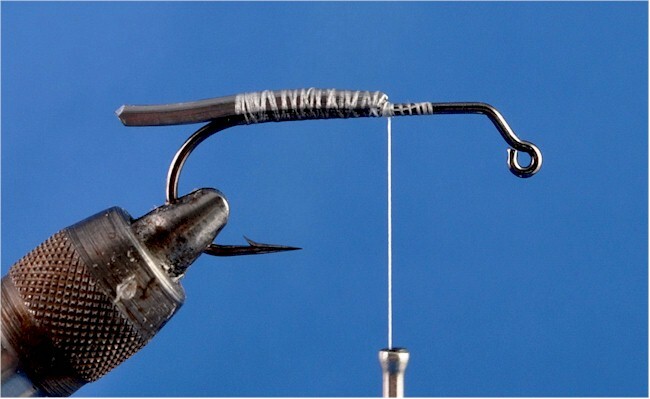 Step 4: Tie the wrapped-lead keel-weight on top of the hook shank, double wraps toward the tail, leaving just a slight gap at the hook bend so the body material can be tied on. Wrap the lead down tightly with several wraps of thread, cement. 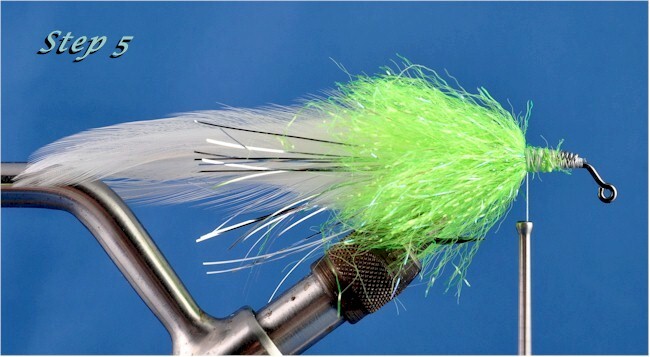 Step 5: Several different types of synthetic hackle can be used to wrap the body. 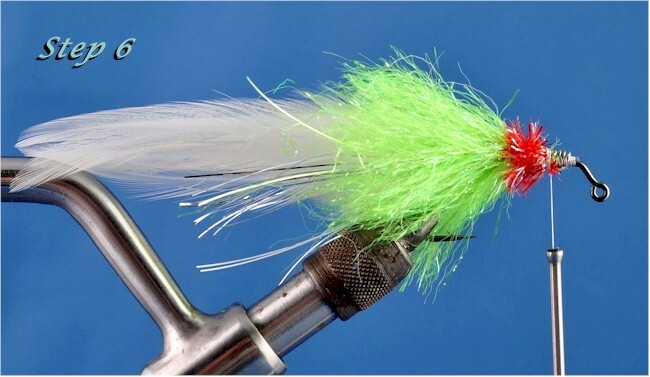 In this case it’s chartreuse “Baitfish Emulator Flash”. I tapper the hackle first, tying it in by the tapered end, wrapping it edge-to-edge wet fly style forward forming a broad Deceiver-style body. Step 6: Take two turns of large, red Cactus Chenille which will form red gills upon completion. 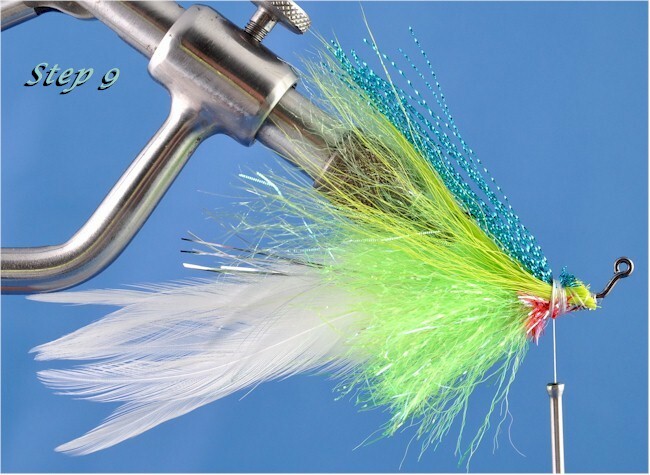 Step 7: Rotate the vise so the hook point is up (or place the hook point up); tie on a medium bunch of chartreuse Flash `N Slinky syn hair over the hook point extending to about half the length of the tail. 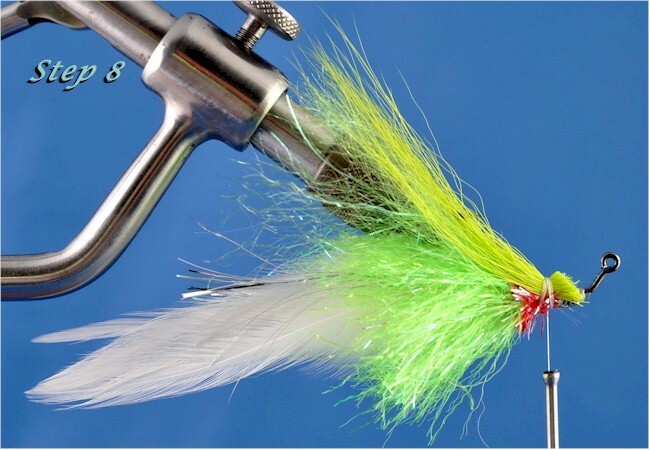 Step 8: On top of the syn hair, tie on a medium bunch of chartreuse bucktail the same length as the syn hair. Step 9: Top the wing with 50 or so strands of light blue Crystal Flash. Step 10: Push a piece of large Diamond Braid over the head so it just covers the Cactus Chenille, tie of the braid and glue. Step 11: Place 3-D sticky eyes on the head as shown. Step 12: Coat the Diamond Braid and eyes with 5-minute epoxy or your favorite head coating. I still prefer epoxy over the UV cure coatings. 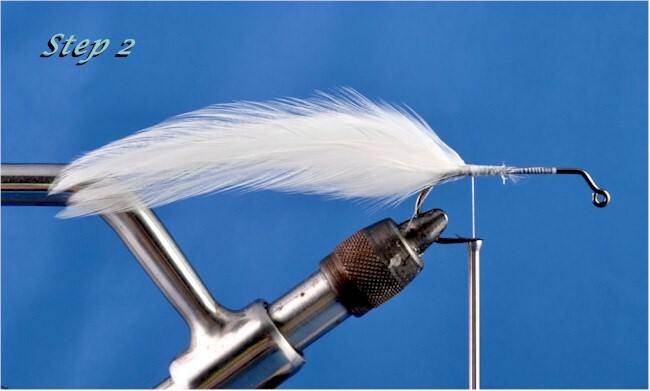 Be sure to place the fly on the rotator perpendicular and not in line so you’ll get a flatter head rather than a round one.